In our house, outdoor toys are always creeping their way out of the storage bin and across our yard—where they then set until I trip over them. 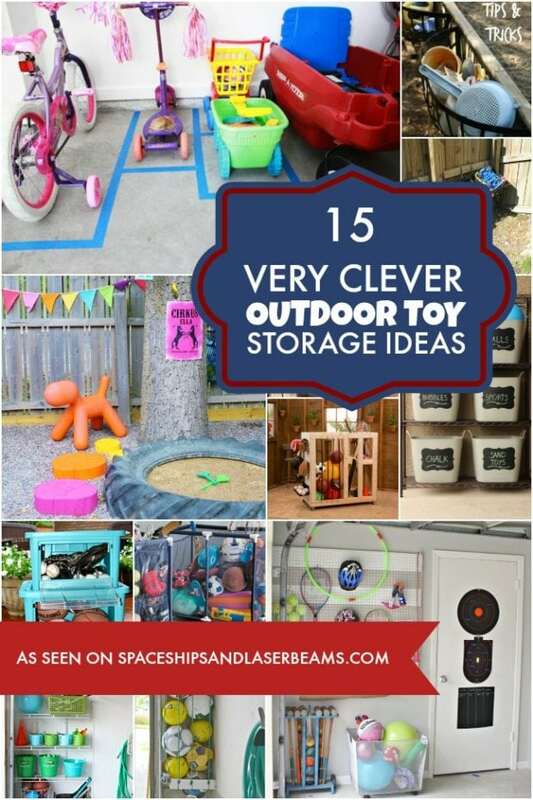 While my son, Sam, might have a little to do with it, my organizational challenges lead me to believe we simply need a better DIY storage solution for his outdoor toys. I’ve been researching some of the most organized backyards and found a number of ideas I really like. 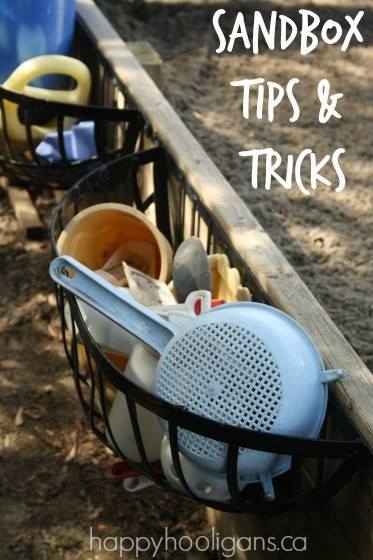 Some of my favorites include bins that hang off the fence, a parking garage for ride-on toys, really cool pool toy storage, pegboard storage for the garage wall and clever ideas to keep the sandbox organized. Now I just need to decide what’s the best solution for our family. Create a family command center to help get even more organized! 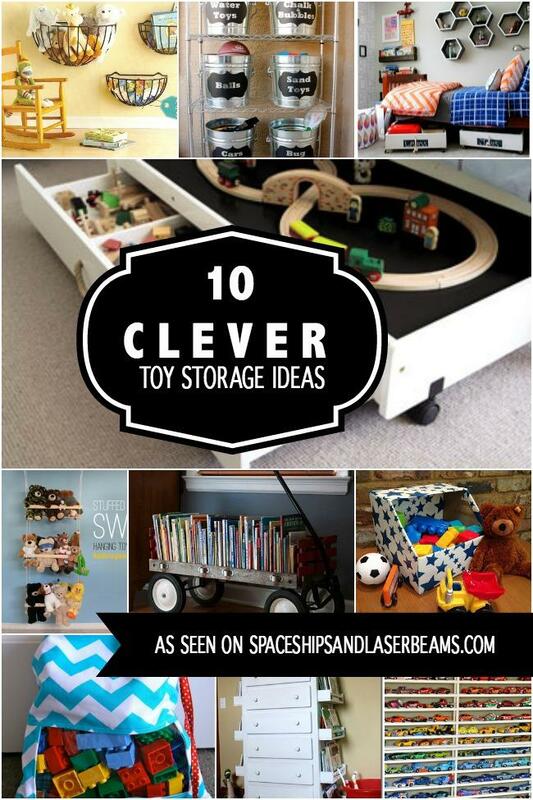 Don’t miss these 10 Clever Kid’s Toy Storage Ideas. 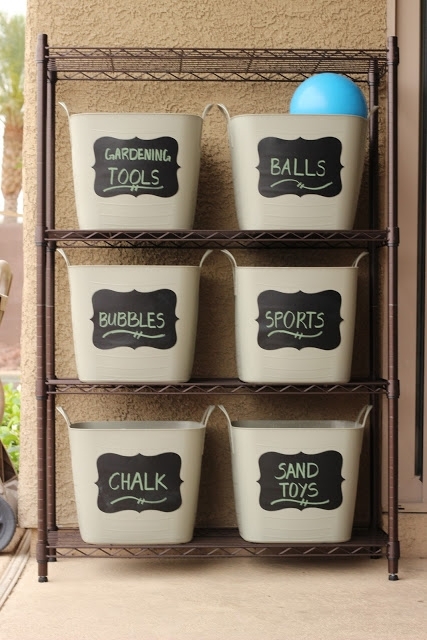 These Outdoor Toy Bins are a great way to organize toys, and are fantastic for the porch, garage, or backyard. The chalkboard labels are a great design feature, as they look good and can be easily changed. 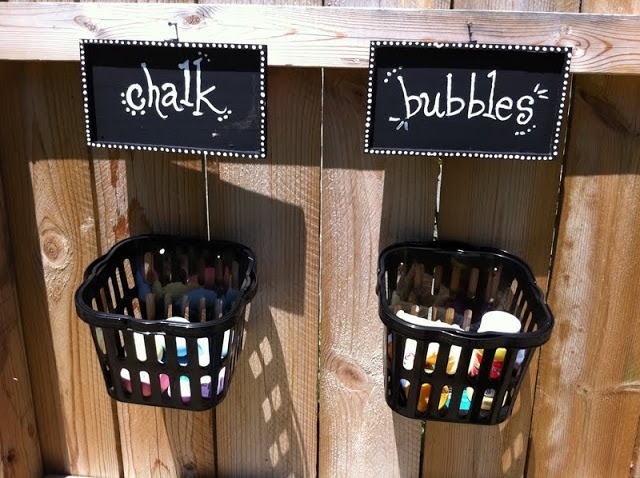 Use stick on chalkboard decals or make the labels yourself using some chalkboard paint. It also makes clean up easy for your kids! 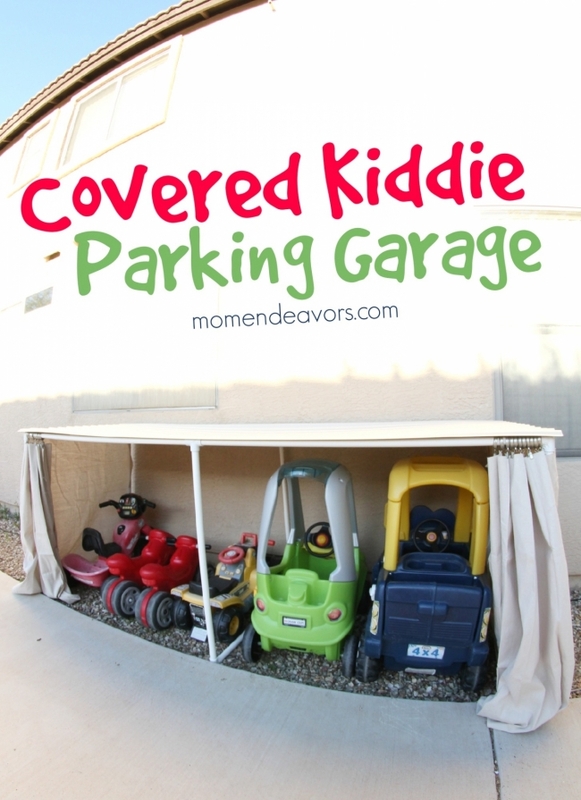 This Covered Kiddie Parking Garage is a great way to keep your kids’ toys out of your yard and packed way, but it’s also a great way to protect them from the sun, making them last longer. Win-win! All you need to recreate this DIY parking garage are a few simple and inexpensive materials from your local hardware store. It would also be super fun to switch out the beige curtains for curtains in a fun color or pattern that match the backyard. Here are six great ideas and tips for DIY Outdoor Storage Strategies that will take your yard from messy to manicured. My personal favorite idea is the hanging milk crates. It’s simple, cheap, and easy for kids to use. Getting the backyard toys off the ground and into child-height containers makes thee yard look way tidier. An added bonus? It is much easier to cut the grass! These Outdoor Toy Caddies are the perfect outdoor toy storage idea, especially if your kids are just learning to read. They can practice reading and cleaning up and organizing at the same time. 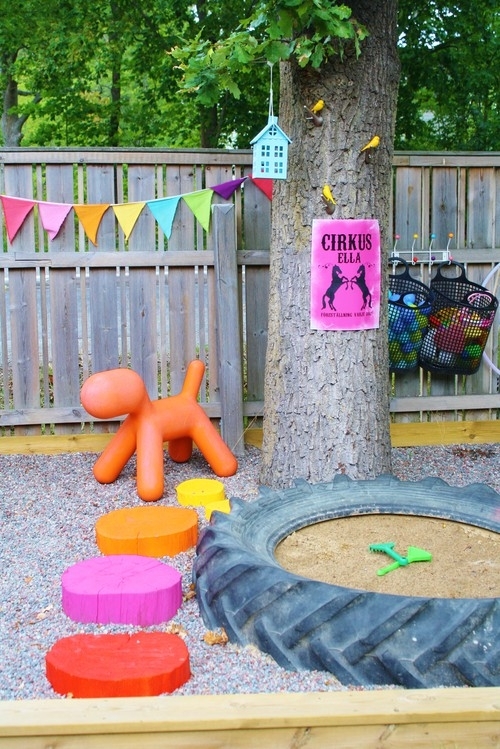 You can also easily change the chalk signs when you switch out backyard toys throughout the summer season. Clean up your bike and scooter filled garage with this great outdoor toy storage idea. It would also work great on a front porch or back patio! The Toy Parking Lot is a great way to teach your kids organizational skills at a young age, which will serve them well into adulthood. 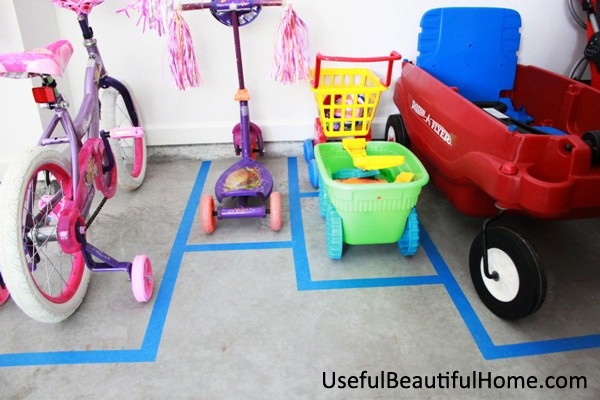 Just use some duct tape or spray paint to mark parking spaces for each of your child’s ride-on toys. Outdoor toys just keep piling up in our backyard. Between sports equipment, water guns, pool toys, and bikes our garage is looking more and more like an elementary school gym! These Large Toy Storage Bins are great storage solution for families like our. They make it easy to store bulky items while also keeping small toys organized and off the ground! Perfect for all you DIY-ers, this Rolling Storage Cart is great for all kinds of outdoor toys and sports equipment. You can also customize it to suit your family’s personal storage needs. 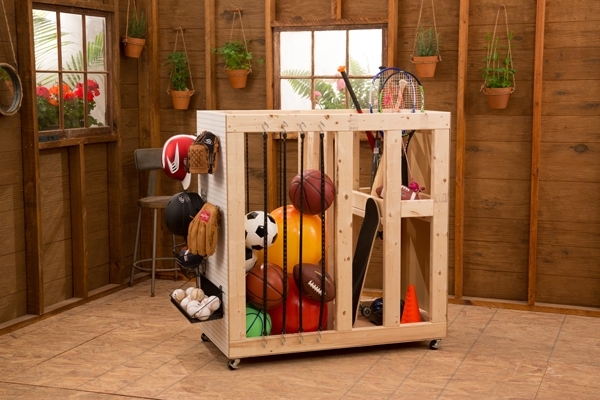 A large bungee cord compartment is perfect for various balls, the peg board is a great spot to hang baseball gloves and helmets, and the shorter shelf is great for storing various smaller pieces. It’s a must have for busy, athletic families. This is a great outdoor toy storage option for the not so DIY savvy. 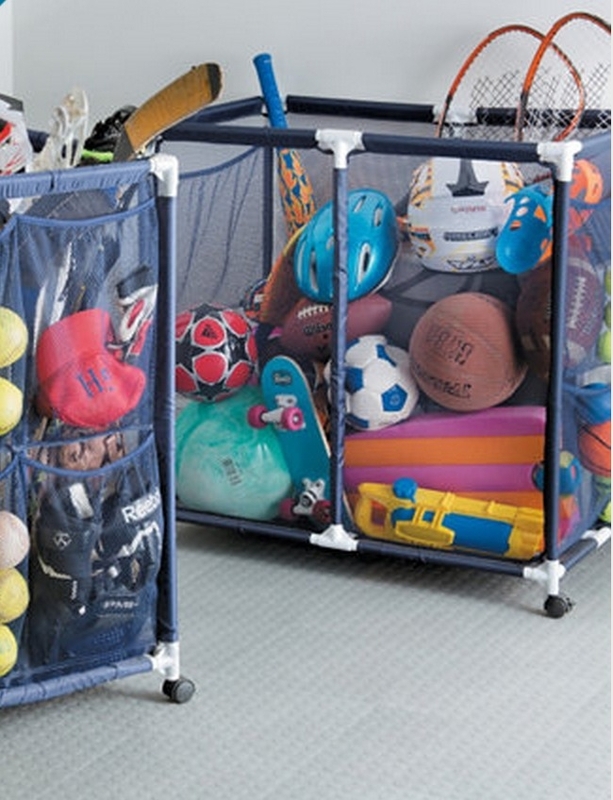 It’s great for sports equipment, and is perfect for kids, as they can see what’s in the boxes without opening them.A fold-down clear front makes the perfect storage solution. You can see everything inside while it’s stored on the shelf, avoiding having to search through all sorts of bins for just one thing. This is an awesome summer hack, and will make poolside organization a whole lot easier. This DIY Pool Towel and Toy Rack won’t require many DIY skills, and I’ll definitely be looking into this one. This is another idea for storing all your kids’ cars, bikes, etc. in your garage, integrating them into a larger, awesome garage storage and organization plan. This is the perfect thing if you’re trying to get a handle on a mess of a garage. 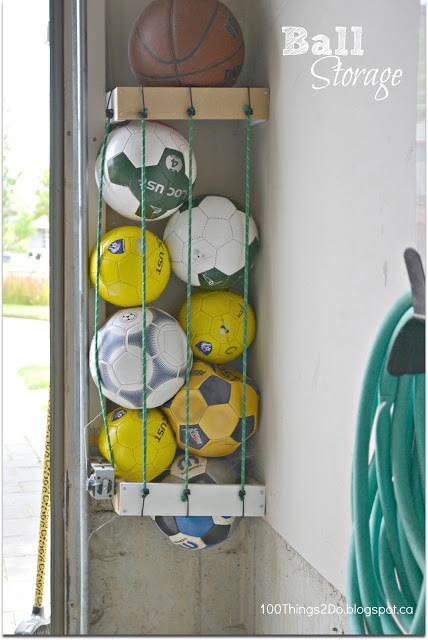 This Bungee Cord Ball Storage is a fantastic way to keep organized if you have a sporty family, and it’s seriously cheap and easy to install. 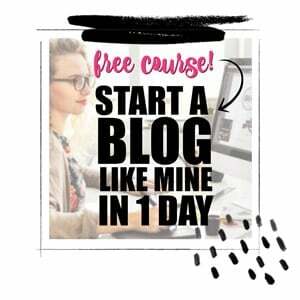 This only cost Shelly from 100 Things 2 Do $2, which is mind blowing. Have some unused space in your garage behind the garage door? Here’s what to do with it — install these amazing shelving units, and kiss your outdoor toy clutter goodbye. There are so many great ideas for Sandbox Toy Organization and sandbox play ideas here, but my favorite is the idea of using old metal planters as storage containers for the sandbox toys. 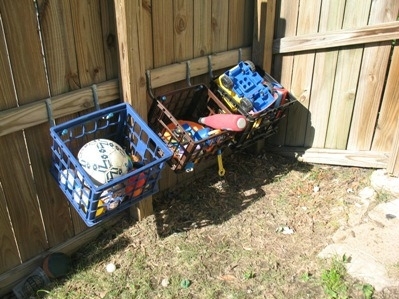 This is a wonderful way to keep outdoor toys stored and organized. Attach some bright and colorful hooks to your fence and hang plastic baskets from them. Make sure that they’re at a height that your kids can reach though, otherwise you’ll be stuck doing the cleaning up yourself. This is an amazingly versatile storage system. 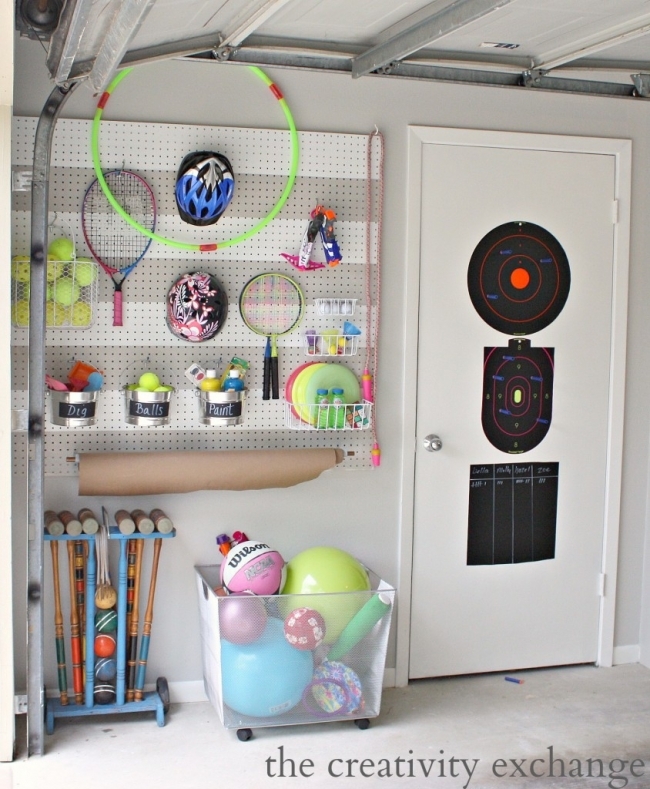 You can decorate your pegboards with whatever colors you’d like, and organize your outdoor toys to suit your needs! CHECK OUT MORE GREAT IDEAS PERFECT FOR SUMMER.